A Waugh Conference was held in April, 2015. I took part. Waugh-hay! But things were so busy with the launch of my book that I didn't have a chance to write up my talk in the aftermath. Not that I had any pictures of the event. But at the beginning of June, 2015, a video went up on Youtube, and it became my intention to use stills from that. However, the fact is, this is being written up three years after the event. Three years! It's a lot to get your head around. I'm not even going to try. Not exactly. This was the scenario. We were inside the College Court complex at the University of Leicester, a much more modern and functional environment than Downside School where the 2011 Evelyn Waugh Conference took place four years before. 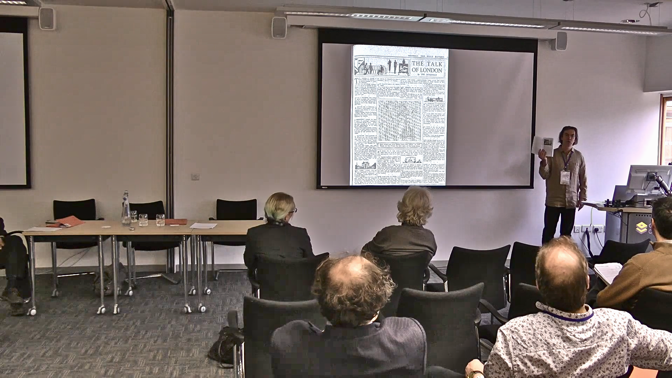 This was the first afternoon of a three-day conference and, in the image below, Tony Vickery, treasurer of the Evelyn Waugh Society, can be seen standing at the lectern having just delivered his talk on Evelyn Waugh and the Oxford English Dictionary. He and I were doing talks under the umbrella heading 'Digital Humanities'. Such was my self-absorption that every word of Tony's talk went in one ear and out the other. 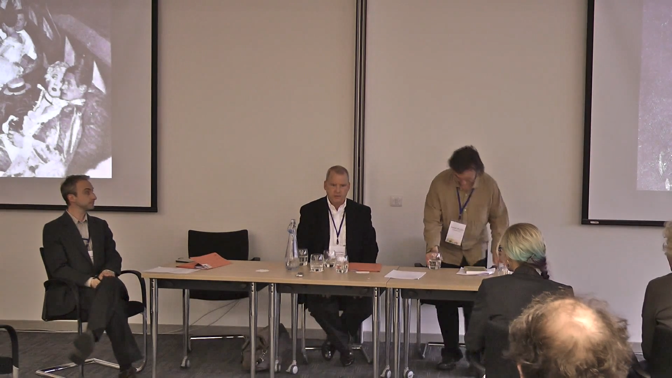 I suppose my excuse for this was that I am not used to public speaking. I've had about one invite per year for the last twenty years, and that's not been enough to overcome my fears of the format. At some level I am nervous in these situations. My mind can do certain things, but fewer things, and less well, than while sitting at my computer. As I am now. I only really did the talk to facilitate what I'm doing now in conjunction with my Mac. Because I envisaged this would add to the story I'm telling of The Evelyns. Another way in, as it were. That's Alexander Waugh: back row, dark jacket. 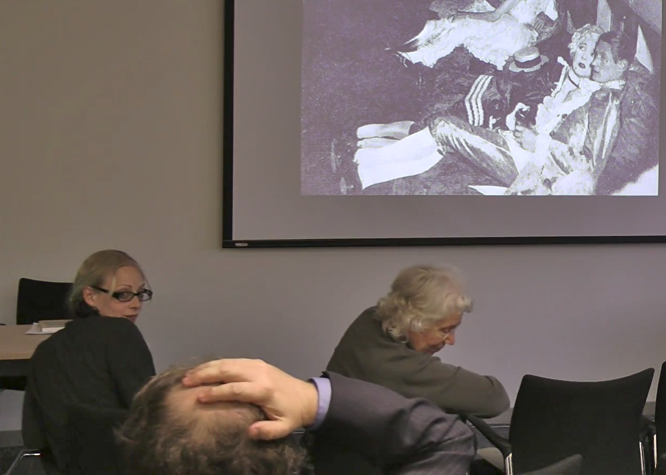 And Emeritus professor Ann Pasternak (editor of CWEW's The Short Stories of Evelyn Waugh): front row, grey jacket. 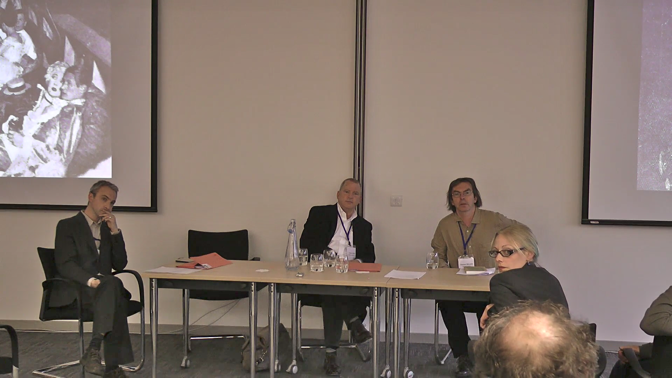 And that may be Professor Simon James (editor of CWEW's Decline and Fall) sitting beside Alexander. 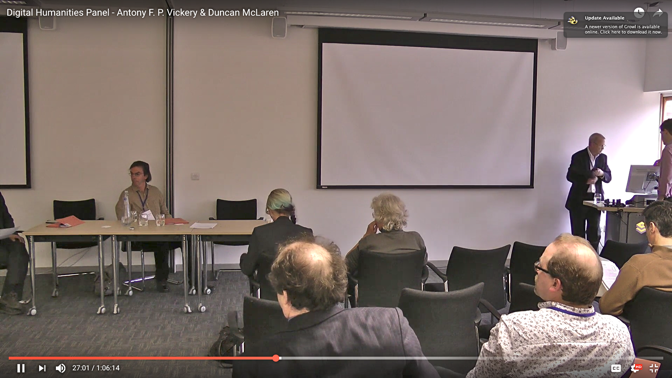 Others in shot may be equally illustrious members of the Evelyn Waugh world, but I can't identify them. "I want to start by saying how pleased I am to be here. My partner is so sick of my passion for Evelyn Waugh that in our house she no longer allows the words ‘Evelyn’ and ‘Waugh’ to be used in conjunction with each other. Perhaps some of you can relate to this." A ripple of acknowledgement. The audience realised I was trying to be funny. "I should start by saying that I have little idea what digital humanities means in an academic context. However, I’ll qualify that by saying that I have been investigating the life and work of Evelyn Waugh for several years, and that recently I have been using my internet connection to take this investigation onto another level. 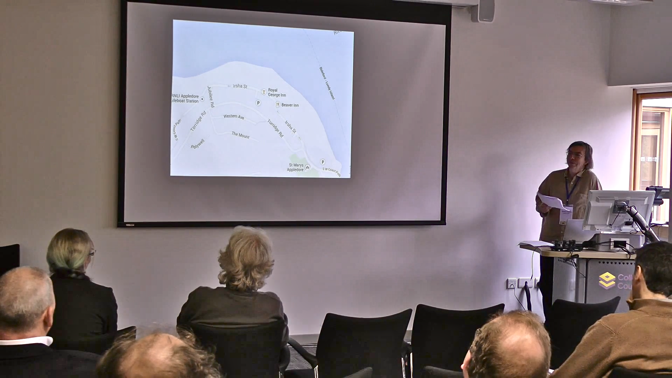 "I’ve titled this talk: ‘Between a Rock and a Soft Place’. The rock is epitomised by the biographies of Waugh by Christopher Sykes, Martin Stannard and Selina Hastings, all printed before 2000. My own book Evelyn!, which is basically a road trip around the sites of Waugh’s life, is a humble addition to the rock. Moss, shall we say. Though, actually, the proof copy of Evelyn! weighs a ton. That’s because very expensive paper has been used to do justice to the illustrations. Page 71, for example. Here’s a picture of The Abingdon Arms where Waugh wrote the first half of Vile Bodies, of which more soon. "Between a Rock and a Soft Place? The soft place is the digital world. The online revolution that’s taken place since 2000 and which is making books like this one redundant. Yes, Evelyn! has become obsolete seven days before it actually appears in print. A fate which we can only hope will not happen to the Complete Works of Evelyn Waugh as they roll off the production line from next spring." That's quite an impertinent remark. 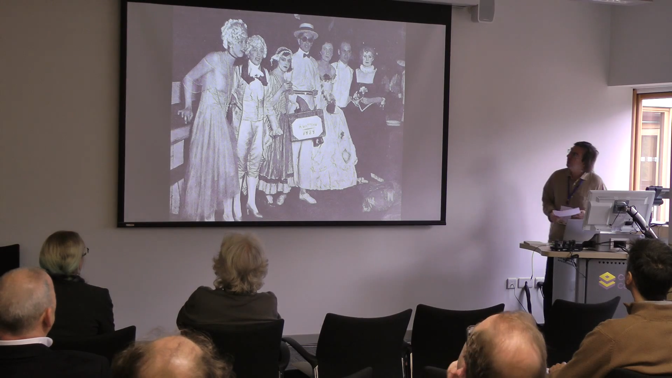 After all, Alexander Waugh, overall editor-in-chief of the Complete Works, was in the audience. But he could take it. "By concentrating on 1929, the year of the writing of Vile Bodies and the break up of Waugh’s marriage, a digital trail will be followed involving The Daily Express archive, the Amazon 'Look Inside' function, iPhoto, Google search engine and Google Maps. That is, the resources available to a non-affiliated, freelance writer like myself. How these resources are being exploited will be briefly outlined and the new information and perspectives they are uncovering will be illustrated." "A quick résumé of 1929. Evelyn Waugh and his wife returned to London from a cruise of the Mediterranean at the end of May. Waugh went off to a country pub near Oxford to write Vile Bodies. Half-way through it, he received a letter from his wife saying that she had fallen in love with their mutual friend, John Heygate. Waugh tried to save the marriage, but within a month John Heygate and She-Evelyn were living in the Canonbury Square flat that the Evelyns had lived in. And a month after that Waugh resumed writing Vile Bodies in a country pub in Devon." I actually needed that résumé myself. The bulk of the chapters in 'The Evelyns' part of my website were added in 2014, not April 2015, never mind November 2018. "Right, I’ve got four case studies to tell you about. 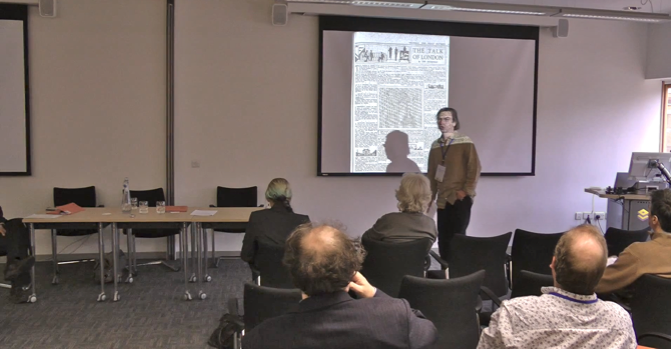 Case One: The Daily Express archive. The Daily Express has been digitally archived, so all a researcher has to do is to put into a search box the words he is interested in, such as 'Evelyn Waugh', and put a constraint on the date, such as ‘January 1, 1929 to 31 December, 1929’ so as not to be snowed under with data. A miniature of all the relevant pages then crops up. "The researcher then zooms in and scours the page until coming across the words that are being sought after. The main thing that comes up if you do this is ‘The Talk of London’, a gossip column co-written by Tom Driberg who knew Evelyn Waugh at Lancing and Oxford. Here is how the column looked on 12 June 1929. It took up most of the inside back page, the rest being advertisements." "Most of the 4th column concerns Waugh. It name-checks Decline and Fall and Vile Bodies. It tells the reader that Evelyn has settled in the country and made a good start to his new novel. 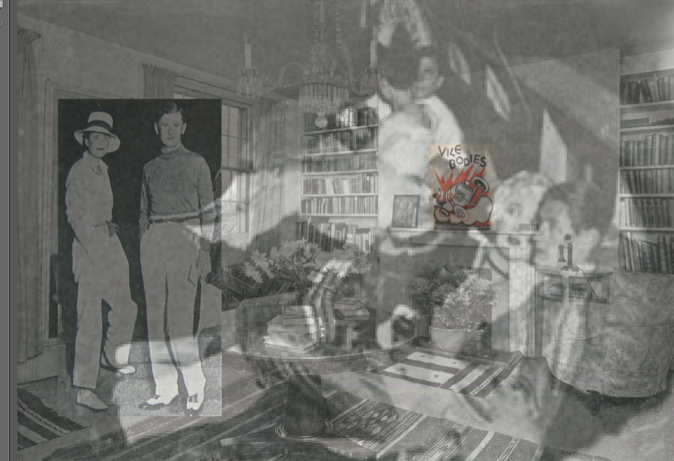 It also tells the reader that Nancy Mitford has moved into the spare room at the Waughs’ Canonbury Square flat." I didn't expect the audience to read the image, just take it in as apicture. Similarly, I don't expect readers of this blog to read it, just clock it. 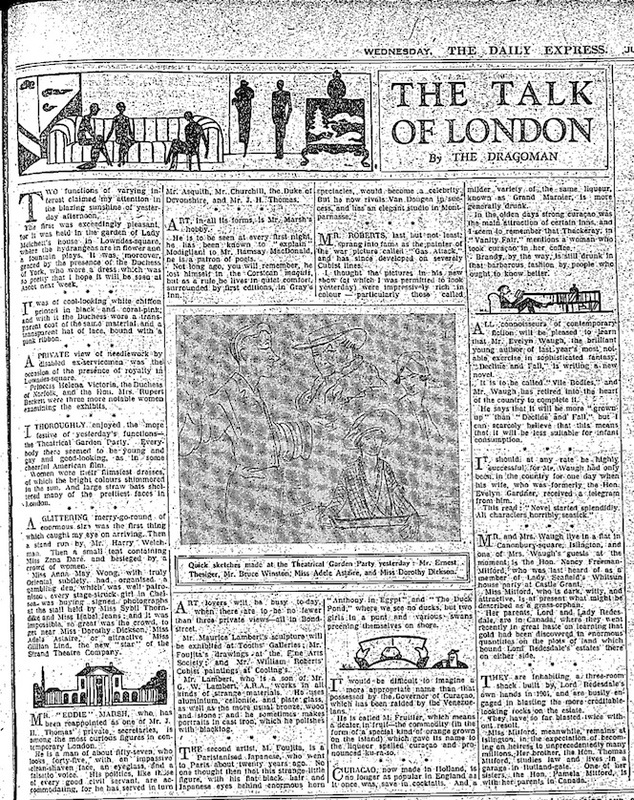 "Waugh crops up in ‘The Talk of London’ 6 times in 1929. It almost amounts to a diary of Evelyn’s social, personal and professional life, appearing in the world’s biggest selling daily newspaper. What fabulous publicity. "John Heygate also wrote for the Daily Express. If you search for him, you realise he wrote several features for the paper, including one on the 10th of July. This is when it’s thought that She-Evelyn’s letter arrived at the Abingdon Arms saying she’d fallen in love with John Heygate. So on the 10th of July, Waugh may have had the doubly dubious pleasure of reading a Dear John letter from his wife and a piece in the Express written by dear John Heygate." I like that. And to be fair, there is a murmur of appreciation from the audience. People are listening, and, I hope, getting something from the illustrations. "What is the article about? It’s about interior design. As is one of the other pieces that John Heygate placed in the Daily Express that summer. I suspect this may have fed into the characterisation of the mother of John Beaver in A Handful of Dust. Amazon’s Look Inside function tells us her name crops up 44 times. Almost always in an interior design context. "But sticking to Tom Driberg’s ‘The Talk of London’ column in 1929. Most interesting is a meeting referred to on September 7, 1929. I will read this aloud as the slide is not crystal-clear." This time I do expect readers of this blog to read the words in the image. "This was just before Waugh resumed writing Vile Bodies. On resumption, Adam, Waugh’s protagonist, is given the job of writing the Chatterbox column in the Daily Excess. Green bowler hats are mentioned seven times. Surely Waugh was intrigued by this meeting with Driberg. Or if not the meeting itself then reading about it in the next day’s Daily Express. "You see, either Waugh had been telling the truth about the green suit, and Driberg had reported it. 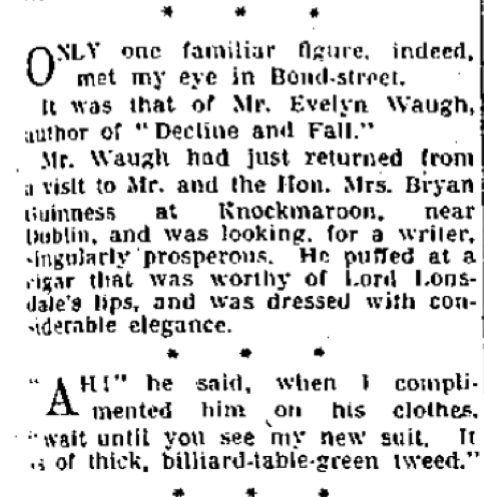 Or Waugh had been making up the story of the green suit, and Driberg had reported it. Or Waugh had said nothing about a green suit, and Driberg had made it up. I can imagine any one of those scenarios fascinating Evelyn Waugh." Again, a murmur of appreciaiion from the audience. I recall trying very hard not to balls up the reading of that last paragraph. It shows how Evelyn Waugh, traumatised by his wife's adultery, was reduced to making up his book as he went along. "Yet this significant meeting is not mentioned in the biographies that constitute The Rock, despite the info having been in the public realm. Why not? Because when the research was done, it would have been very easy to miss, using pre-digital research methods. Who is going to look through 300-odd copies of the Daily Express of 1929 on the look-out for every mention of Evelyn Waugh and/or John Heygate? Not Christopher Sykes. Not Martin Stannard. Not Selina Hastings. There simply isn’t time. Well, Selina does actually mention a comment in the Talk of London that the new drink was green beer, but that wasn’t written until 1930. And it’s less interesting that Tom Driberg may have been influenced by Vile Bodies than Tom Driberg may have influenced the construction of that novel. 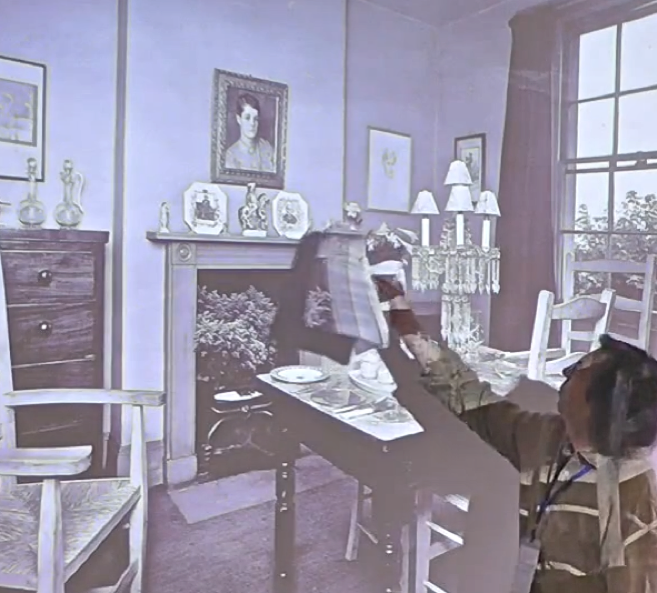 Now, thanks to digitalisation, the researcher effectively has thousands of eyes on the case." I paused at that point. And I recall congratulating myself. I realised that the talk was going reasonably well. My piece was so well-written, with extra spaces between each sentence, that I could read as much of the talk as I wanted, just departing from the written script when I was especially confident of what I was going to say. "OK. Case Two. Involving the use of iPhoto, Google Search Engine and Amazon 'Look Inside' Function. "Here is a photo of the Waughs’ Canonbury Square flat, taken by Evelyn Waugh, I believe, at the end of July, 1929. "This has been in the public realm for at least forty-two years, as it appears in David Pryce Jones's book, Evelyn Waugh and his World. What has been said about it? "Well, much has been said about the portraits, which are all of He-Evelyn or She-Evelyn. 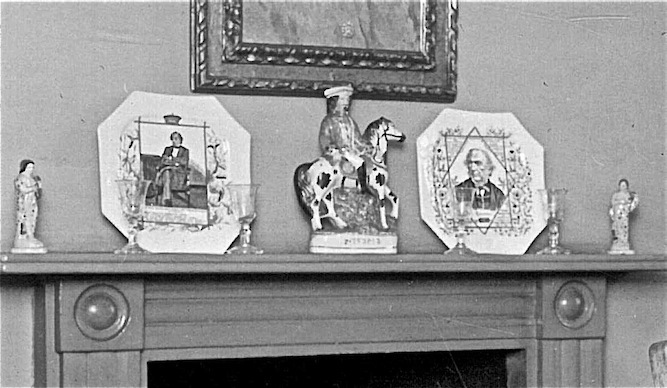 Nothing has been said about the decorative plates on the mantelpiece." 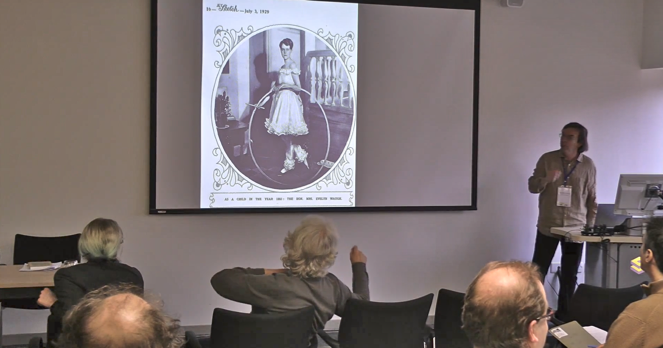 "If you use iPhoto to have a close look at them, it looks as if they could represent Victorian figures." 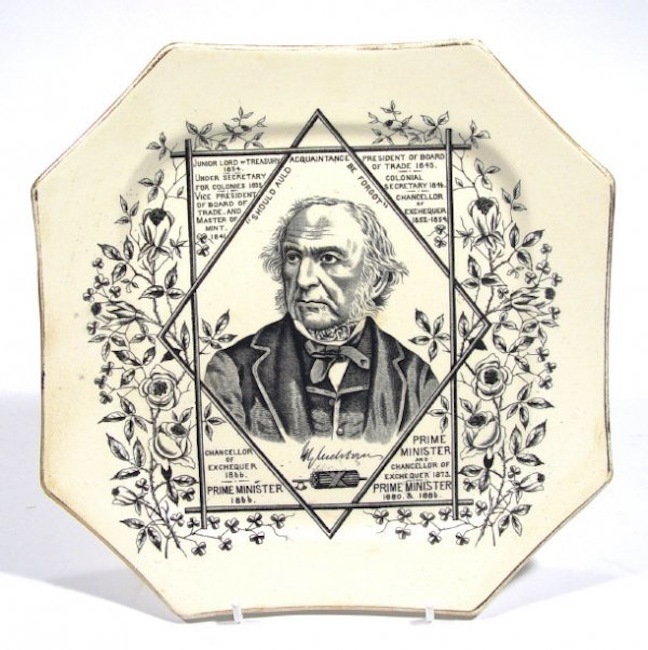 "Googling ‘octagonal plate’ + ‘images’ comes up with an example of a famous Victorian figure on the very first page of results. The internal framing looks right. Sure enough, more image searches come up with the plates in question. William Gladstone and Benjamin Disraeli, Liberal and Tory prime ministers and great rivals in the House of Commons." "If you go into Amazon, look for Vile Bodies, click on the cover to operate the Look Inside function, and put in ‘James Brown’ the Conservative prime minister in the novel, you get six results. And if you put in ’Walter Outrage’, another VB prime minister, you get 19 results. "Commentators have been content to assume that the prime ministers referred to in Vile Bodies, in so much as they had real-life inspirations, were Stanley Baldwin, Conservative, who had been prime minister until a week after Waugh got back from his Mediterranean cruise; and the labour politician, Ramsey MacDonald, who became PM on June 5 1929, just when Waugh was on the point of settling down to write Vile Bodies. It's easy to see why this pair has been taken as the parallel to the pair of PMs in the book, but the identification of the decorative plates points at another likelihood. "Arthur Waugh, Evelyn's father, was born in 1866. By the time he was reading Dickens every night to his sons, Evelyn and Alec, around 1910, he was 44 and Disraeli and Gladstone had been PM for more than half Arthur's then life, and I expect Arthur let young Evelyn know as much. Did he bore his son with political talk to the same extent that he did with his Dickens obsession? I don't know. But it wouldn't surprise me that Evelyn had a good old retrospective dig at Disraeli and Gladstone. Especially Gladstone." "William Gladstone was the subject of sexual scandals when he was in office, due to his passion for helping prostitutes. While Walter Outrage is shown to be unhealthily sexually obsessed with Japanese women. It seems to me that Waugh is careful not to say that Walter Outrage is a Labour politician. I think he wanted ambiguity as to whether he was Labour or Liberal, Ramsey McDonald or William Gladstone. "This information about the plates has always been there but, as far as I’m aware, it’s only just come to light. Why? Well, it only takes seconds to Google ‘octagonal plates’. But in pre-digital times, a researcher would have had to get a photographer to make a good enlargement of the relevant bit of the photograph, choose a decorative arts expert, hope that this expert would pay some attention to their query, and wait for their reply to a letter. A cost-benefit analysis on all that would have told the researcher not to blooming well bother. And something significant about the way Waugh went about constructing his fiction would have been – has been - missed. Oof. What just happened there. There was Evelyn Waugh standing in his dining room in 1929 thinking back to dinners of 1928, in a room that referenced Prime Ministers of his father's time. Then I joined them there... Me in 2015, giving the lecture... Me in 2014, making my discoveries... And now me in 2018, trying to take it all on board. I'll just let that settle in for a minute. "OK, Case Three. 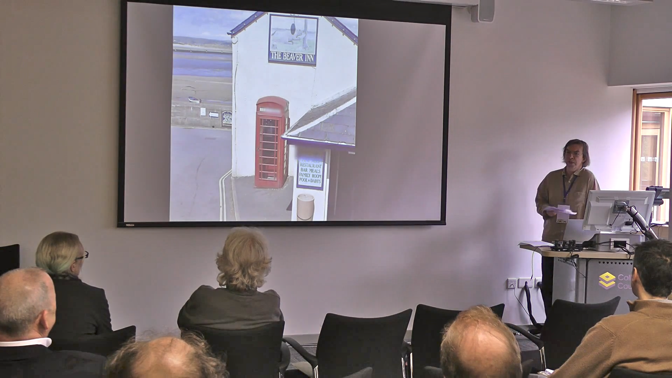 Using Google search engine and a digital photographic archive." "The rock tells us that Waugh went to the Belfast TT Road Race in August 1929. 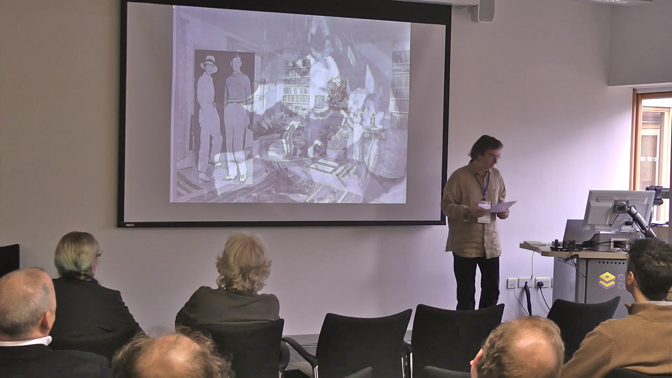 The Rock – both rocks, actually - suggest that he was ‘probably’ accompanied by David Plunkett Greene and Alastair Graham. 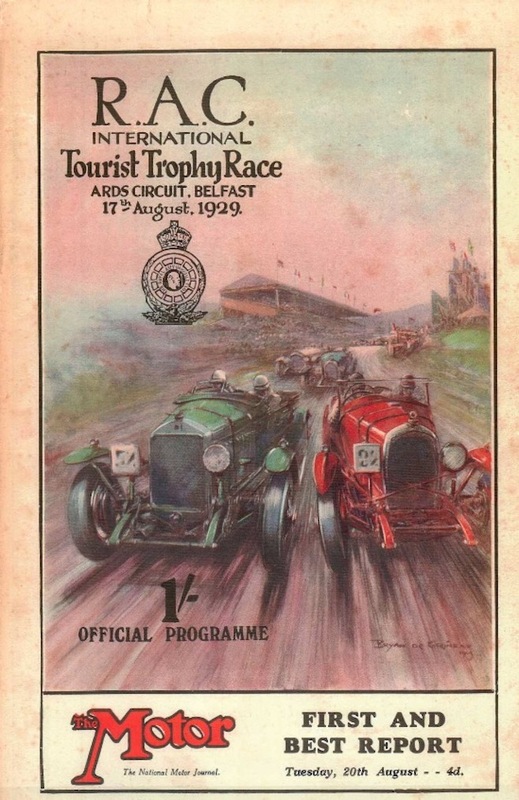 "If you Google ‘Belfast Tourist Race 1929’. Top of the search list is a pdf file of the official program. I don’t suppose earlier researchers knew of the existence of such a document. Where in the library would it be found? However, it’s become obvious to me that Waugh was referring to this program when he wrote the long chapter ten of Vile Bodies. 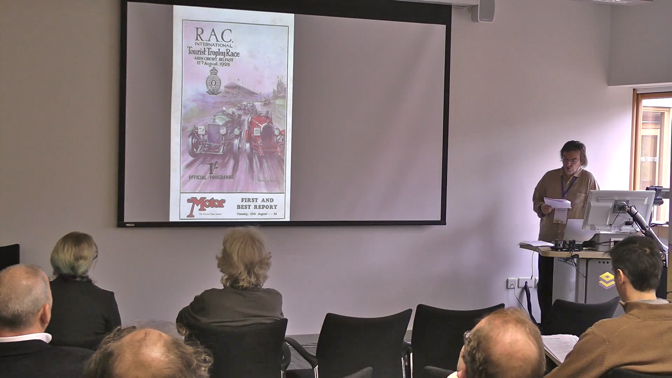 Martin Stannard was at my talk. He's used this image in the Complete Works of Evelyn Waugh edition of Vile Bodies, published in 2017. He doesn't acknowledge that sitting here at the Waugh Conference in 2015 is where he first came across it. Maybe that wasn't the case. After all, what I'm saying is that the digital revolution has made all sorts of information much more accessible. It would certainly have come to light sooner or later without my efforts. "In Vile Bodies, the name of the English car that Adam and his group are supporting is a Plunket-Bowse. This name has been made up from the slightly mis-spelt 'Plunkett' of the programme, plus a slight misspelling by Waugh of the actual driver of car 38 (Bowes becomes Bowse)." "Accompanying Evelyn to the races was in fact Richard Plunkett Greene, Evelyn’s close friend from Aston Clinton School days. Richard was the Reserve Driver in Belfast - see his name prominent in column five - just as Agatha Runcible was the Reserve Driver in Vile Bodies. Richard and Evelyn had a long history of drinking to excess in each other’s company. One time, returning to Aston Clinton from a night out in Oxford, Richard, who’d been driving them, was sick and had to lie immobile at the side of the road, alternately dozing and vomiting for two hours while Evelyn sheltered from the rain as best he could. And I can imagine that the fact that the Reserve Driver was unfit to drive due to drinking was a running joke on the afternoon of the Belfast race. "It matters that it was Richard and not David Plunket-Greene. He was the man who gave Evelyn a motorbike at Aston Clinton, introducing him to fast personal transport. Chapter 10 of Vile Bodies says as much about their relationship as it develops the theme of the novel. "If you put in a search for images of the Belfast TT, you soon come upon the LAT photographic digital archive, which has lots of pictures of the day’s race. This photo shows the pits. "The pits in Vile Bodies are a line of booths, built of wood and corrugated iron immediately opposite the Grand Stand. 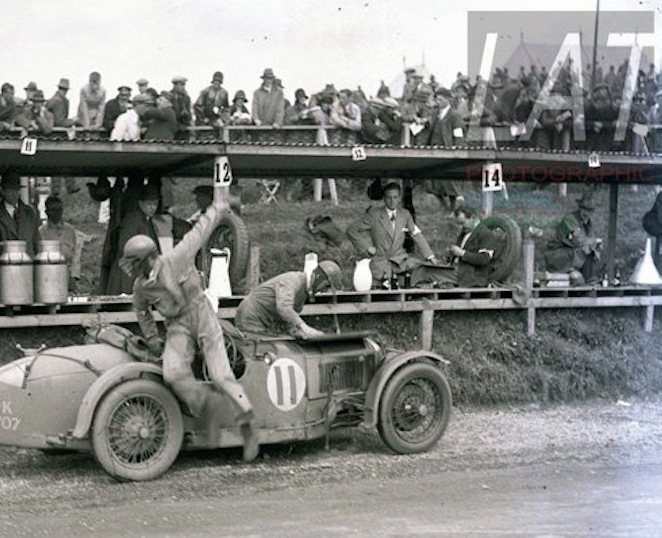 Cars are surrounded by mechanics and spectators. Busy officials hurry up and down, making entries in their lists. "This photo also reminds me of the scene where Agatha is smoking in the pits and is told not to by an official. She throws her cigarette over her shoulder and instead of it falling into one of the churns containing petrol, it falls into one containing water. Twice more Agatha lights up and is told off by an official. Actually, the sequence of her reactions is hilarious. The first reprimand is followed by: 'My dear, I'm terribly sorry. I didn't know.' Second by: 'My dear, how awful of me. I quite forgot.' Third by: 'What a damned rude man. Let's go up to that divine tent and get a drink.' I can’t help wondering if Richard made the same kind of remarks to officials on the day of the race itself. "The picture shows there is no pit 13. Because there is no car 13, as that would be unlucky. 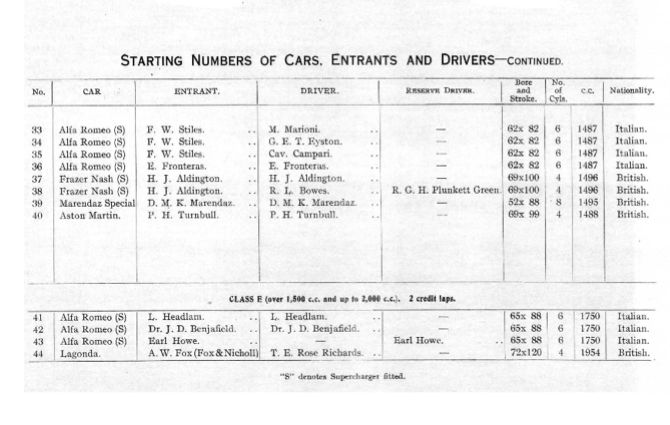 And so Evelyn chose car 13 to be the one driven by Reserve Driver, Agatha Runcible. 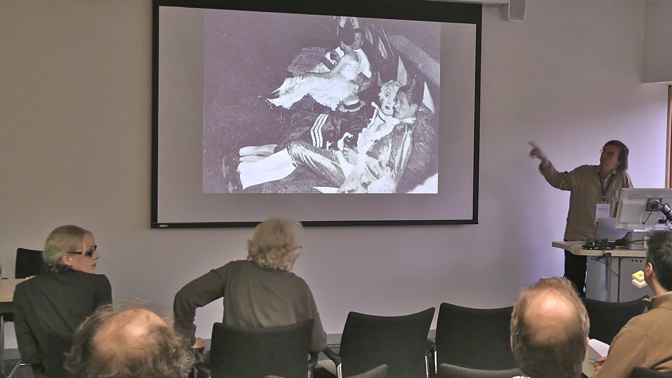 "There is no question that you build up a picture of chapter ten of Vile Bodies thanks to the LAT digital photo archive. 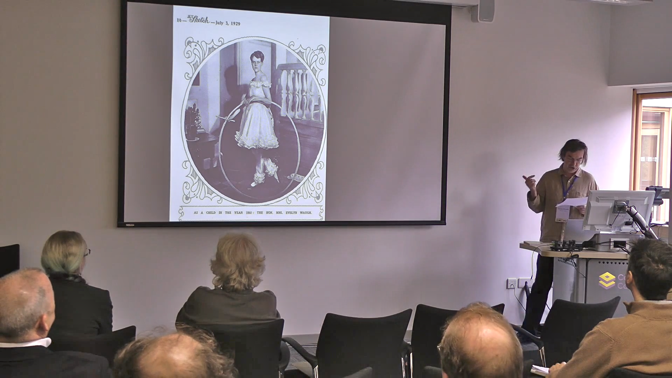 The photos of the event would have existed in pre-digital times. But they would have been much less accessible to a researcher. Now they are just a few clicks away from wherever you are. I was looking at them on the train coming down to Leicester today." In the CWEW Vile Bodies of 2017, Martin Stannard includes a photo from the LAT digital archive, which I first used in an Evelyn Waugh context on this page. I wish Martin had acknowledged that. But at least he does refer to this website in one note to his text introducing the novel, something he promised he would do when we spoke backstage at the 2015 conference. Thank-you, Martin. 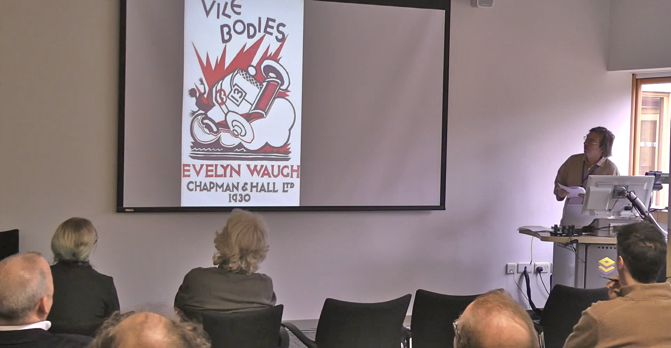 Imagine the horror of doing all this work on the subject of Evelyn Waugh's Vile Bodies and then it being ignored when the definitive scholarly edition was put together! It doesn't bear thinking about! Though when one works outside academia and don't publish in 'reputable journals' one has to expect nothing back. Anyway, I need to get this in proportion. I was made welcome at the conference. 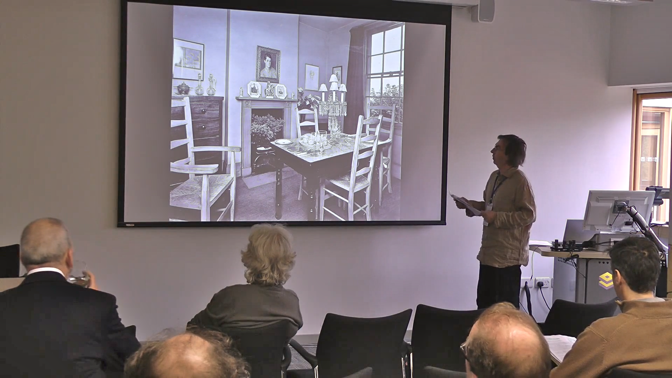 I was allowed to give a talk and academics turned up for it. "OK. Case Four. Involving Google Maps and Street View Camera." "Waugh came back to the UK from Ireland. Bumped into Tom Driberg on 6 September, and soon after was installed in a pub called the Royal George in Appledore, Devon. I doubt if Martin Stannard or Selina Hastings thought it was worth visiting the pub. I didn’t when I was writing Evelyn! having stayed so long at the Barley Mow where Waugh wrote Decline and Fall. But now casually visiting a place is made so easy due to Google Maps and the Street View camera. 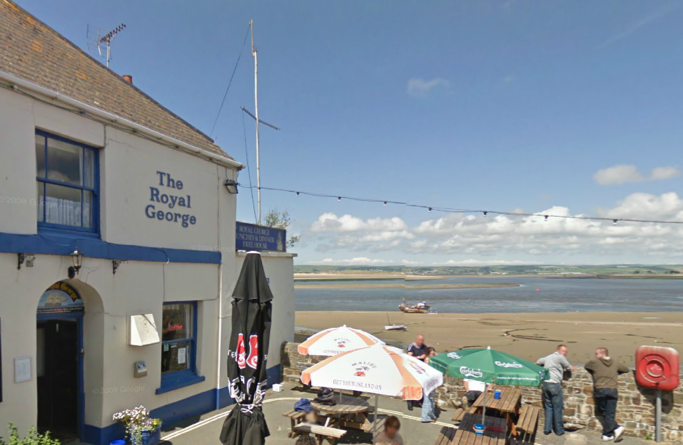 "This is a picture of the Royal George." "In Vile Bodies, Waugh has Adam and co staying at a Royal George next to a canal the night before the road race. But it was Evelyn Waugh that was at a Royal George a couple of weeks later writing up the race in his novel. "In Vile Bodies, Mr Titchcock has to give up his bed to Adam. (Self-loathing Evelyn Waugh giving way to his fictional protagonist?) Adam notices a tailor’s dummy and remembers one called Jemima from his childhood that he attacked with a chisel. The perforated female form is perhaps a symbol of his hatred for and rage against She-Evelyn. The evidence is all quite deeply embedded, I doubt very much if Waugh wanted it to be dug up. But the Royal George is the clue to putting real life and fiction together. "The following Google Map shows that there is another pub very close by. It’s called the Beaver Inn. "Every day, Waugh was writing about Ginger Littlejohn and no doubt had the character in his mind as he took a daily constitutional. The word Beaver may have become associated with Ginger Littlejohn, who is effectively John Heygate. So when a couple of years later, Waugh was revisiting the impact of She-Evelyn’s adultery, he chose the name John ‘Beaver’ for John Heygate." "This parallels how he came up with the name Margot Beste-Chetwynde in Decline and Fall. In the 1983 TV biopic about Evelyn Waugh, Tony Bushell tells the viewer that when Evelyn was at Hertford College, Oxford, two of the men in residence at one staircase were called ‘Best’ and ‘Chetwynd’. Waugh saw the conjunction of names every time he walked the quad, and it stuck in his mind to be used in a book later, just as ‘Beaver’ seems to have done so from his time at Appledore. Yes, I'm almost finished my half-hour talk. "...Although it’s long been established in The Rock that actual events fed into Waugh’s fiction. Digital resources allow greater pinpointing of the vital biographical stimuli and encourage more consideration of the inter-relation of biography and text. 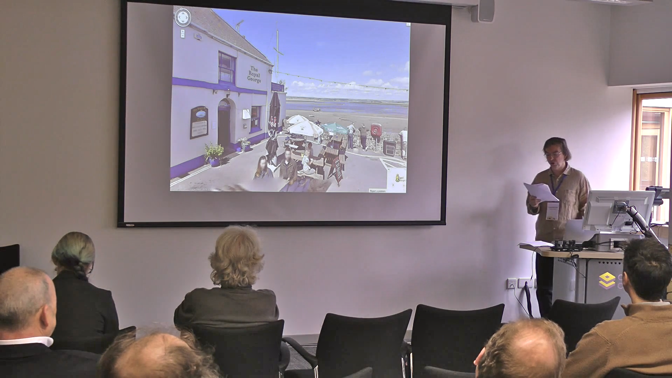 In particular, one, Google Maps and the Street View camera allow the researcher to follow in Waugh’s footsteps. Two, The Google search function allows one to ‘research out of the box’. Think ‘octagonal plates’ and ‘Belfast TT 1929’. And three, Newspaper archives give vital information about Waugh’s location and meetings. More papers are being digitally archived all the time. "However, I want to add a note about another resource: Adobe InDesign (or Photoshop)." No sound of disappointed rustling from the audience. They were still willing to pay attention. "First, let me invite you to an 1860 party at the Guinnesses house on June 25, 1929. Here is She-Evelyn dressed as a Victorian child in trousers." "Later that night, She-Evelyn, Nancy Mitford and John Heygate went on to another party on the Friendship, a boat moored at Charing Cross. John Heygate is in the middle of this picture." 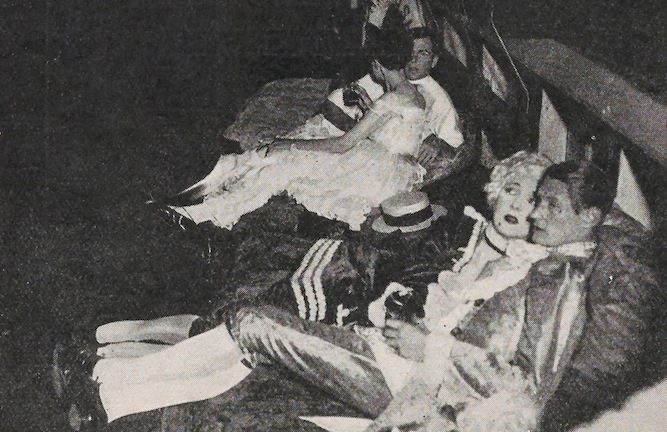 "That night a compromising photo of She-Evelyn with John Heygate was taken. 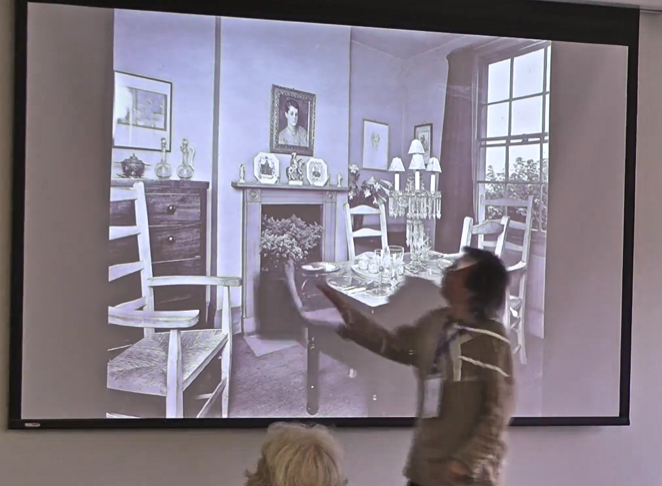 That’s the couple in the background of this photo:"
"Now here is the companion photograph of the dining room at Canonbury Square that I showed you earlier, being the living room at Canonbury Square, and featuring a provisional cover of Vile Bodies painted by Evelyn Waugh on the mantelpiece. I believe the photo was taken by Evelyn Waugh and it features, on top of a pile of books lying on the table, Living by Henry Yorke which came out in June 1929 and which Waugh much admired." "I am fascinated, even obsessed, with this image... "
I am fascinated, even obsessed, with this image. 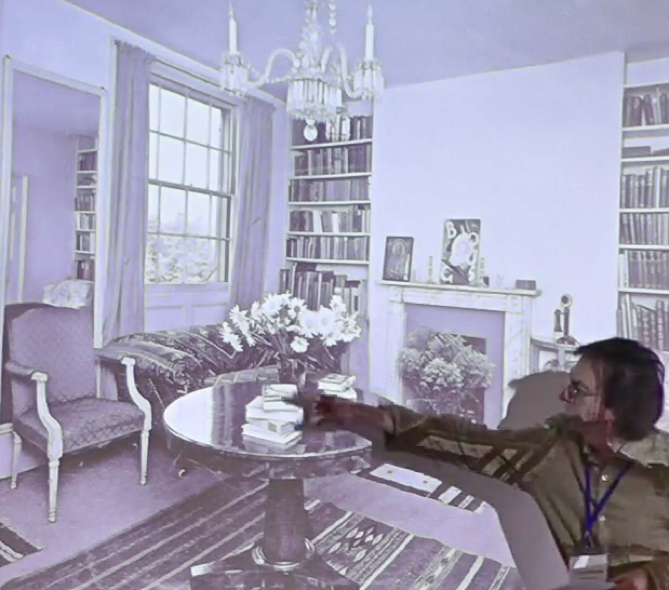 This living room, and the dining room, had represented something solid to Evelyn Waugh. His home. Shared with his wife. At last some stability! He would publish books. Clever friends of his, such as Henry Yorke, would publish books too. And they would have dinner parties at which witty husbands entertained each other and their pretty, feisty wives. Wasn't that what living was all about? But hang on, what was I saying? "....and with the image of She-Evelyn and John Heygate. Adobe InDesign allows me to create a composite image, using a couple of other images into the bargain." The living room is invaded with doubts and with phantoms. All that was stable becomes unstable. All that could be relied on proves unreliable. When Evelyn Waugh took the photograph of the empty living room, was this what he was seeing in his mind's eye? 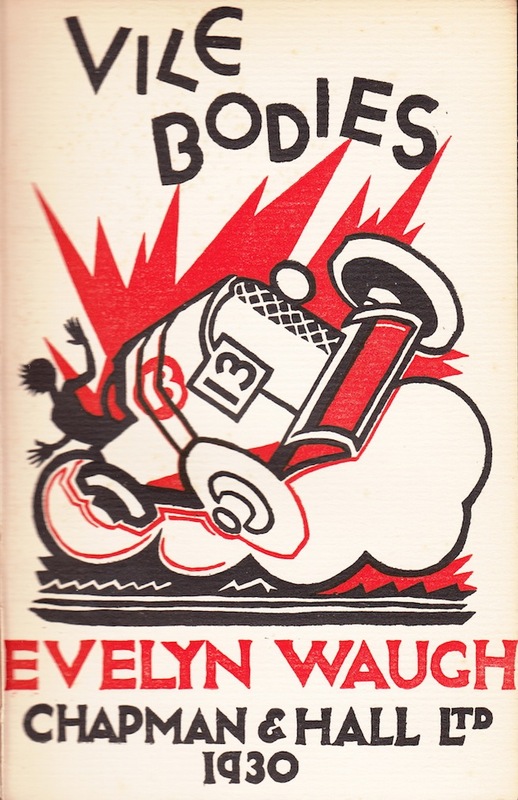 "These phantoms and nightmares being the final Evelyn Waugh design for the cover of Vile Bodies, and a picture of the Evelyns on the Friendship a few weeks after She-Evelyn and John Heygate had been photographed on that same boat." 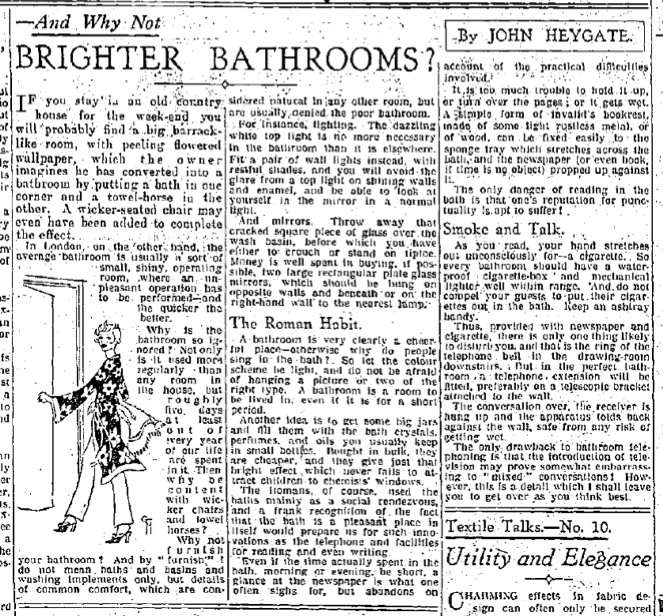 "It’s quite possible that Evelyn Waugh was even more obsessed with these images than I am..."
"...On or about the 10th of July, 1929, Evelyn may have been faced with the letter from his wife saying that she was in love with their friend, John Heygate. Plus the piece in the Daily Express by Heygate. Plus a copy of the Tatler with the pic of Heygate and She-Evelyn canoodling in the background of the Friendship. "I think it all may have prayed on his mind." And I returned to my seat, an exhausted man. 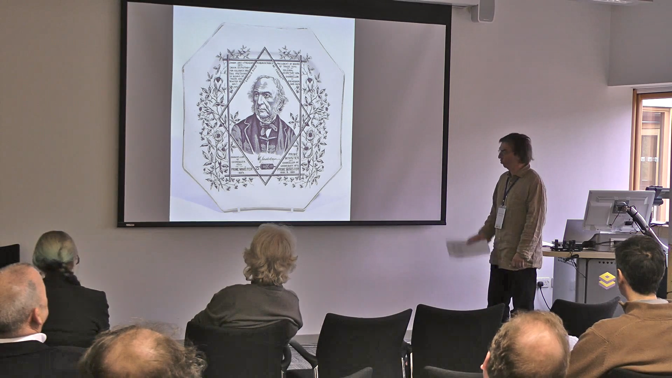 Oh the nervous energy expended on the day of a public talk! Feeling all right, though. Job done. Or nearly. 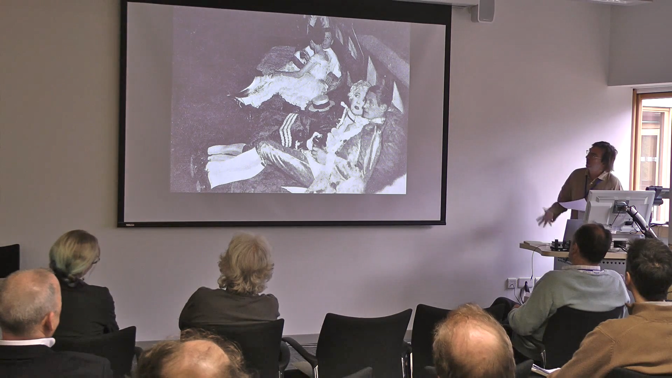 Because after a few questions for Tony about his talk, I was asked a question as to where I found the image of John Heygate and She-Evelyn together, as the questioner had long looked for it in vain. I answered as best I could, that a letter from John Heygate made me realise such a photo existed. And having registered the photo of She-Evelyn going to the Guinnesses party, I was able to spot the dress she was wearing in a set of pictures taken on the Friendship that same night. 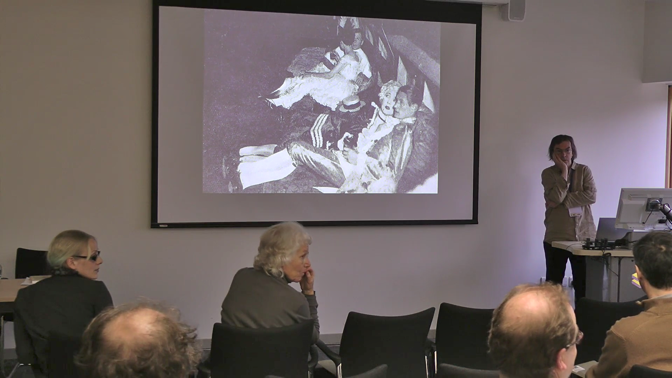 Alexander Waugh piped up to say that Jacqueline McDonnell once referred to this photograph. 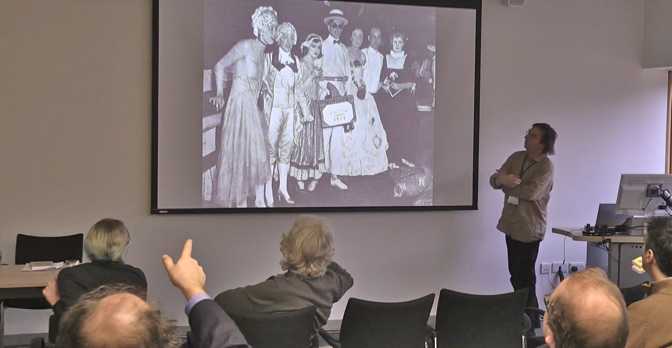 Alexander told us that in her book, or in her article, McDonnell suggested it was John Heygate in this photograph, having recognised the straw hat that John Heygate was wearing in my other slide. He suggested that my point about She-Evelyn's dress confirmed the identification. ...And I went through the relevant images once more so that everyone could follow. 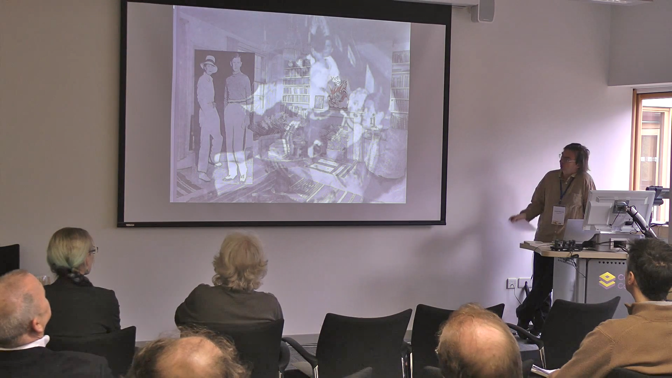 Martin Stannard got involved in the conversation, as did Ann Pasternak Slater. Above is She-Evelyn at the Guinnesses party. Below is John Heygate a few hours later on the Friendship. And, below, there, in the background, are She-Evelyn and Heygate together; she still in her ballet shoes and trousered dress, he having taken off his sunglasses and his boater. We talked a little more about images. In 2011 when my book was due to be published by Beautiful Books, Alexander kindly provided me with three photos, the ones I call the Barford Triptych. In 2015, I suggested that I'd crawled all over them and wondered if there were more that I might take a look at. Alexander told me there were images taken of Piers Court before and after the Waughs moved in. I expressed my ardent wish to see these at some stage and Alexander welcomed that idea. As I sat down again, Don Gallagher asked if I ever came across an article that Evelyn Waugh wrote on the back of his day at the races in Ireland. He's editing the CWEW volume, Essays, Articles and Reviews of Evelyn Waugh. And, as I said with what I hoped was a warm smile, if the article existed I'm sure he would have come across it. Good that Alexander, Don and Martin were in the audience. Editors of three of the first batch of five CWEW volumes due out in 2017. So perhaps the essay on that is the place for the interested reader to go next. Well, no, that hasn't been posted yet. Bear with me. This whole site is a work-in-progress. One day I'll flick a switch and these pages will - as one - blaze with energy, mass, integrity and insight. 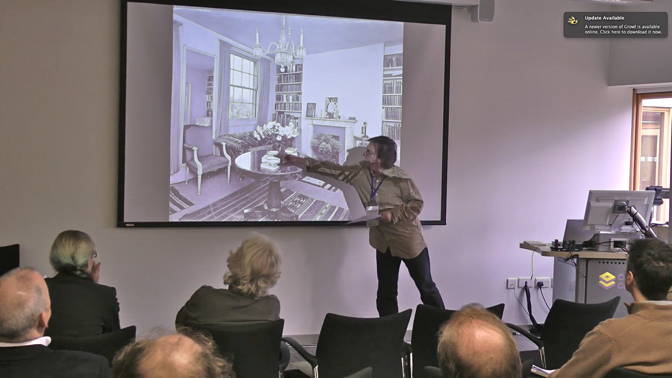 Several of the talks given at the 2015 Conference are available to watch on Youtube. See this link. 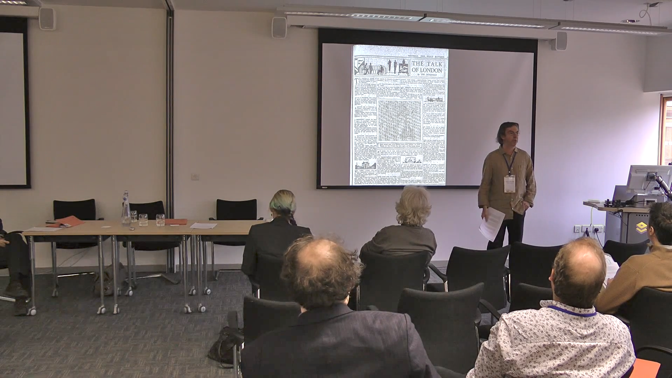 For another perspective on the Waugh Conference of 2015, courtesy of Rebecca Moore, see here.